Vice President Young called the October 23, 2017 Regular Meeting of the Board of Commissioners to order at 7:03 pm. He followed with a prayer and the Pledge of the Allegiance. He announced that Proof of Publication was available for review. Commissioner SCHIN made a motion to approve the minutes from the October 2, 2017 budget meeting of the Board of Commissioners. Commissioner HOLTZMAN seconded the motion. Motion carried 3-0-1. Commissioner Schin abstained as he was absent from the meeting. Commissioner SCHIN made a motion to approve the minutes from the October 9, 2017 regular meeting of the Board of Commissioners. Commissioner HOLTZMAN seconded the motion. Motion carried 4-0. President Black arrived at 7:06pm. Mrs. Stacy Grumlich thanked the Board for the opportunity to discuss the West Shore Recreation Commission. She stated that there will not be an increase in fees for next year. She stated that 2018 will be the 50th year of the Recreation Commission. Vice President Young spoke about serving on the Recreation Board and thanked them for their hard work through the years. Mr. John Minito thanked the Township for use of their facilities and thanked President Black for his support and for serving with them. 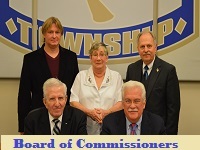 The Board thanked them for their hard work in providing recreation to the Township. President Black advised that any Commissioner, staff member, or anyone in attendance could request any item on the Consent Agenda be removed for further discussion and asked if there was such request. There was no response. Drainage Plan No. 2016-04, 2800 Appleton Street, New England Motor Freight. Probation period ending for Captain Crone. Department Reports for the month of September for Assistant Manager, Community Development, Township Engineer, Fleet (August and September), Public Works, and Public Safety. Tax Collector’s September 2017 monthly report. Commissioner SIMPSON seconded the motion. Motion carried 5-0. Vice President YOUNG made a motion to approve the Check Register of October 13, 2017 in the amount of $198,866.88. Commissioner SCHIN seconded the motion. Motion carried 5-0. 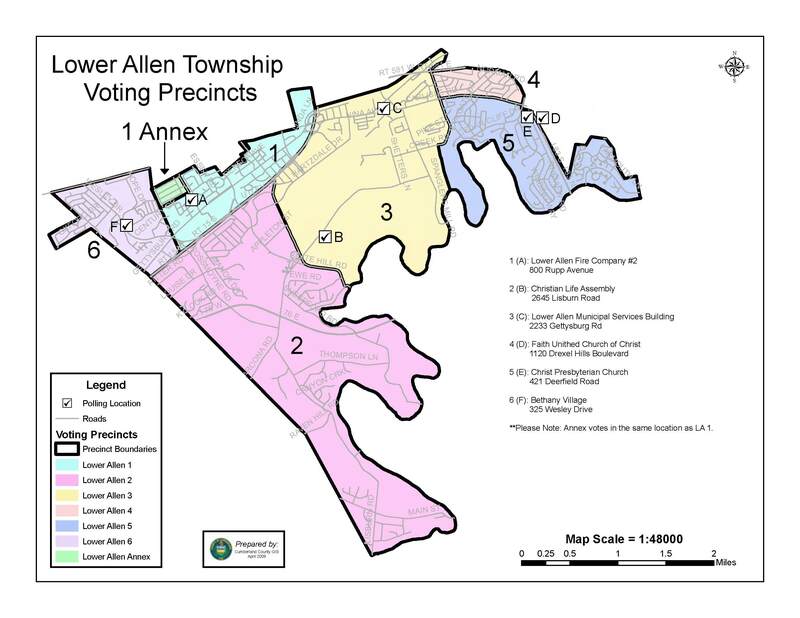 Vice President YOUNG made a motion to approve Ordinance 2017-07, an ordinance of the Board of Commissioners of Lower Allen Township, Cumberland County, Pennsylvania, amending, modifying, and changing the code of the Township of Lower Allen, 1997, by: Adding an exception for altering a traffic control device at Section 209-7; adding speed limit restrictions at Section 209-50, adding traffic control signals at Section 209-51; adding prohibited turns at intersections at Section 209-53; adding lane and turn restrictions at Section 209-57; adding stop intersections at Section 209- 58; adding closure of certain streets to certain vehicles at Section 209-60; amending weight limits at Section 209-61; adding parking restrictions at Section 209-63; adding parking prohibitions for certain hours and/or days at Section 209-64; and adding a special purpose parking zone at Section 209-66. Ordinance 2017-07 was approved by a 5-0 vote. Mr. Grove stated that the Capital Budget is a five-year plan. The plan sets the course for budgeting for the next five years. He spoke about internal and external funding and how they relate to long-term debts. He discussed outside agencies with the Township’s debt policy. He stated that tonight is to review the Capital Budget. He stated that some projects have an “L1” designation, which is a top priority. He stated that some of the L1 are regulations the Township needs to comply with next year. L1 designation also indicates there may be revenue that may come in for the item or will reduce maintenance expenditures. Community Development (CD) has one Capital item for replacement vehicles. Mr. Vernau stated that there are four currently in CD but they are rusting and will be replaced by electric vehicles. He stated that the vehicles are from 2003, 2004 and 2005. Mr. Flint stated that they won’t all be replaced by trucks as that isn’t needed. Finance has a copier/scanner for a capital expenditure. Mr. Grove discussed the continued expenses with fixing the current one and printing of the checks and the sewer/trash bills. Public Works Building – 2018 for design services with construction in 2019. Vernau stated that they are still interested in doing this and spoke about the Hampden tour. They looked at leasing/purchase the Bell building, but it has been sold. Having the snow equipment out in the elements is bringing them up for replacement 5-7 years earlier. Mr. Flint spoke about reducing the proposed building size and a more reasonable per square foot cost. Upgrade to brine marking unit – electronic upgrades to system to operate correctly. Vernau mentioned that the price of brine for sale could be increased or eliminate sales. Public Works Windows – to replace leaking older windows. Vernau stated that the windows are from 1991 and are getting water on the inside. Gas island unground pump manhole covers – are settling and needs replacement. Radiant tube gas heaters -for open shop area to heat area. Shed replacement – located behind building and is no longer serviceable due to deterioration. This shed replaces two sheds, one of which has already been torn down. Pave Drive – This is covered by the recreation in-lieu-of fee. He spoke about the project, which is quite expensive. LACP Barn HVAC upgrade – this will help climate control, especially with rentals. Fun Fort – a grant has been applied for this project and should hear back in October. Landscaping for the rain gardens – Mr. Vernau stated that it is for the municipal building rain gardens and landscaping around the building. This is not a new project. JD mower to replace – needs to be replaced and is used throughout the parks. Allendale fence replacement – older and needs to be replaced. Mr. Grove stated that there were two unknowns going into the operating budget. The police contract, which is still ongoing, and healthcare. Healthcare came in at an increase of 10.4%. The General Fund currently has a $746,260 deficit. Staff will be seeking the Board’s input next week during the budget meeting. Mr. Vernau asked the Board if they wanted to discuss any of the projects in the five years. Vice President Young spoke about the excellent job Staff has done so far with the budget. Commissioner SCHIN made a motion to release the security improvement for SLD Docket No. 2014-02 Executive Park West Building 5. Commissioner SIMPSON seconded the motion. Motion carried 5-0. Vice President YOUNG made a motion to accept a Time Extension for SLD Docket No. 2017-04 -145 S. Locust Street, establishing a new deadline of February 11, 2018. Commissioner SCHIN seconded the motion. Motion carried 5-0. Commissioner Simpson would like to see the 72 hours parking restriction on the streets because of the size of some streets. Street parking and issues are handled by Public Safety. Director Holl spoke about concerns with fire trucks passing through a street with RVs parked on streets. Extensive discussion ensued. Mr. Vernau stated that the following appears to be the consensus of the Board: No RVs of any length can be parked over 72 hours on the street, when parked on the street wings can’t be extended, can be parked on private property if on pad or driveway, and they must be licensed and registered. Mr. Vernau stated that he would take the current ordinance and make the changes discussed tonight for the RV parking. Mr. Vernau asked the Board about the prohibiting the use of tarps/wraps to cover items visible from the street. This could include tools, cars and other things. Commissioner Schin spoke about covering bushes with the weather. Commissioner Holtzman spoke about a resident using a tarp to cover their carport. President Black spoke about a complaint he received from resident where a tarp was used over a boat that is framed around it. The consensus of the board was not to pursue this. Mr. Vernau stated that the Board was in favor of requiring a permit to remove trees from both the public right-of-way and from private property to address insurance coverage and traffic control. Commissioner Schin agrees with the insurance issue for the contractor. Mr. Flint stated that they ensure the contractors have workers compensation insurance. Mr. Vernau stated that the permit process would include obtaining the contractor liability insurance and a traffic plan. President Black would be in favor of requiring all contractors taking trees down having liability insurance to protect our residents. Mr. Vernau asked about right-of-way tree removal for non-public safety reasons. Commissioner Schin doesn’t think we should ask a reason for tree removal. Mr. Vernau asked if they can deny a permit for this reason. President Black asked if we have a tree ordinance. Solicitor Miner stated that as a first-class Township, they can have a Shade Tree Commission who regulates trees and replacement. He stated that it can be done by the Township versus a Commission and a lot of times it is volunteers who replant the trees. Commissioner Simpson asked about MS4 and trees. Mr. Flint stated that the MS4 would encourage more trees. Extensive discussion ensued. Mr. Vernau will have draft changes to the ordinance at a future meeting. Mr. Vernau spoke about his memo about including Autism Spectrum Disorders in our range of coverage. He stated that the Board would need to decide to add this to the health plan. There would be no separate charge for this coverage. Commissioner SCHIN made a motion to add health coverage for Autism Spectrum Disorders to the Township’s insurance coverage beginning in 2018. Vice President YOUNG seconded the motion. Motion carried 5-0. Mr. Vernau had a meeting with non-firefighter volunteers with Lisburn. He stated that they amended the resolution based on the input and every seems happy. He spoke about the requirements for advertising, hearing, and adoption. Director Holl spoke about the new software and how it could help with tracking the hours of volunteers for this credit. Discussion ensued. He stated that he would review the advertising requirements with the Solicitor and bring it back at the next meeting to set a hearing date. Mr. Grove spoke about “funding average” from an article in the Pension Investments magazine. Anything over 80% of pension funding is good. He stated that the Township’s rate is over 95%. Mrs. Banks thanked Mr. Vernau for including non-firefighter volunteers and thanked the Board for considering the credit. Commissioner Simpson was at PSATC in Pittsburgh this weekend and spoke about the error in spelling on the awards. Mr. Vernau is going to take care of this issue. Commissioner Schin asked about the recent issue in the Rossmoyne development and community alerts. Director Holl spoke about how fast the event happen, how they were out of the development very quickly and they are working on the process. He spoke about the recent issue on Wesley and how they are using social media for notifying the public as well. Director Holl spoke about fire prevention week and visiting the schools. He stated that they found some fire issues during their visit and will be sending letters to those locations. Mrs. Trone spoke about the turnout for the Allendale-Beacon Hill Trail event. Captain Crone thanked the Board for their vote of confidence. President Black spoke about being at a PSATC event this weekend and touring the Hampden public works building.